During the wintertime in Manhattan, I often forget that I&apos;m on an island. Sure, I&apos;m aware the Hudson and East Rivers are chockablock with ferries, tugs, Coast Guard vessels, and myriad commercial boat traffic, but walking along the skyscraper-walled canyon of Madison Avenue tends to skew one&apos;s perspective. Spring can&apos;t arrive soon enough. In late May the PMY crew starts spending evenings and weekends cruising the waterways around New York City aboard Office Ours, our company boat. While her moniker is always the same, we receive a new model each spring—it&apos;s research, dear reader. 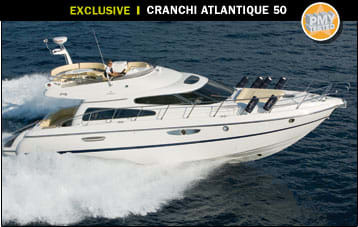 For 2007 PMY welcomes the largest Office Ours yet: the Cranchi Atlantique 50. 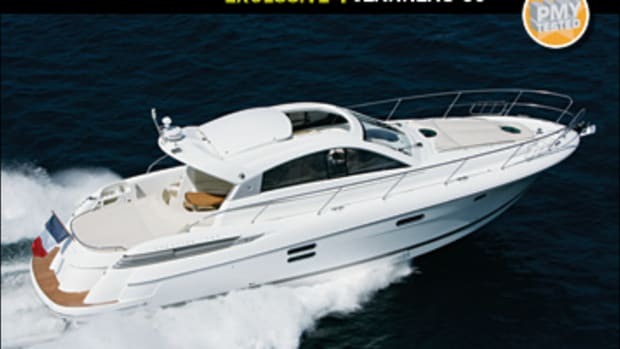 As I boarded a 50 at Cranchi of Florida&apos;s quay in Pompano Beach and made my way to the flying bridge via teak steps, Office Ours&apos; homeport of New York City was on my mind. Why? She was shoehorned among a gaggle of boats with a face dock about 55 feet off her bow, circumstances she&apos;ll likely face in her summertime quarters at Manhattan&apos;s North Cove Marina. So while Cranchi&apos;s James Clayton handled lines, I stood at the starboard helm, started the standard twin 575-hp Volvo Penta D9s, and assessed the situation via unobstructed sightlines in all directions except aft, where I could just discern the swim platform through the opening that leads down to the cockpit. From the start, the 50 displayed agility that should serve her well over the summer. 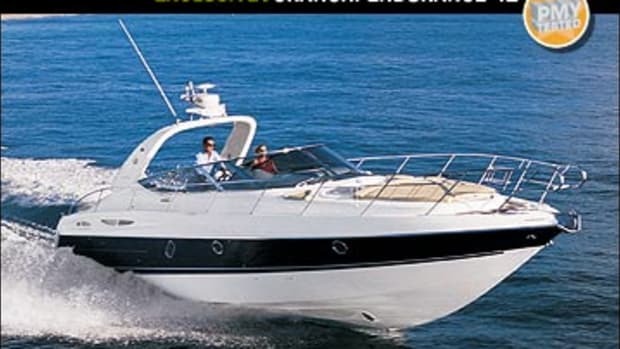 I goosed the Volvo Penta single-lever controls, and her 24x36 five-blade props got a good bite, allowing me to adroitly pivot the 50 right out of the slip, execute a tight S-turn, and make my way towards the Atlantic. Credit is also due to the low-end torque, generated by the powerplants and their Twin Disc transmissions with 1.77:1 reductions. After a short trip up the canal, we reached the 14th Street bascule bridge just as it was closing; we&apos;d be hung up for at least 15 minutes waiting for it to reopen. And so we encountered another set of circumstances that PMY daytrippers will likely face this summer: station-keeping among other vessels and obstacles. Despite a strong oncoming tide, 15-mph gusts, and an ever-increasing number of boats, I was able to hold position with the throttles alone; not once did I need to reach for the Cranchi&apos;s wheel or the standard QL bow thruster. Good timing and positioning allowed us to be the first through the bridge upon its opening, past the 1906 Fresnel-lensed Hillsboro Lighthouse, and into the Atlantic. Once we&apos;d cleared the southern jetty, I firewalled the throttles and aimed the 50&apos;s bow into the two-foot chop as she reached an average top speed of 37 mph in less than 30 seconds. 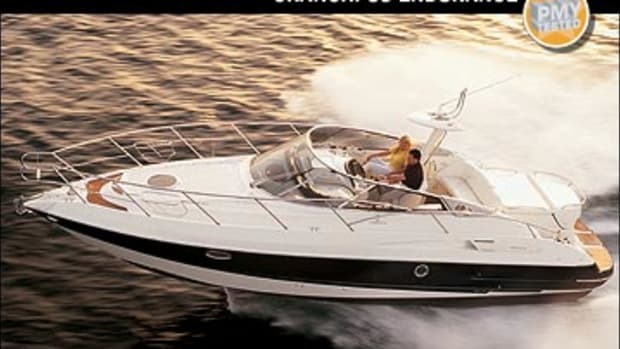 Her solid fiberglass hull and fiberglass-encapsulated, box-stringer system absorbed the chop with little fanfare, while I executed a 180-degree turn in just over two boat lengths sans the considerable lean that&apos;s seen on some high-profile vessels. Clayton explained that such transverse stability is achieved by utilizing low-weight Kevlar and carbon-fiber laminates in the flying bridge and superstructure, combined with a hull that features a sharp entry and almost-flat aft sections. 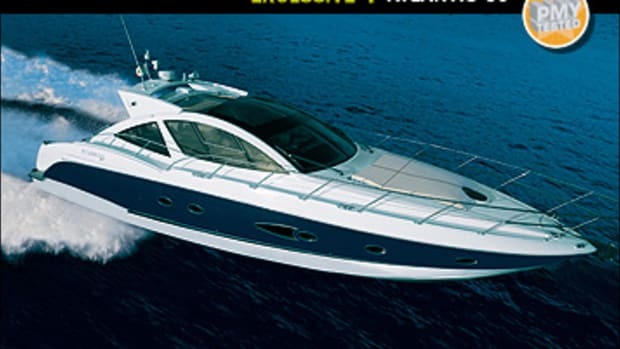 In addition, a favorable longitudinal center of gravity allows installation of the powerplants deep in the hull; her two 201-gallon transverse fuel tanks are amidships, forward of the engines. As Clayton explained this, I backed off the throttles and aimed for the Gulf Stream: At 25.8 mph and 2000 rpm, the 50 made 0.83 mpg, good for a range of 301 miles. With these kinds of numbers, I was already planning summer weekend jaunts from the stifling concrete jungle of Manhattan to a breezy anchorage off Newport. 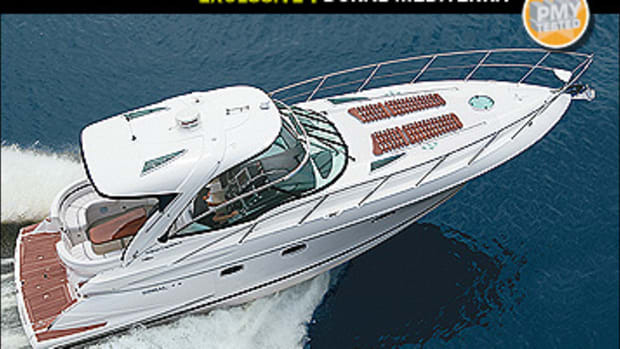 I reluctantly relinquished the helm and took a seat at the bridge&apos;s aft C-shape settee. I could easily imagine the PMY crew up here. 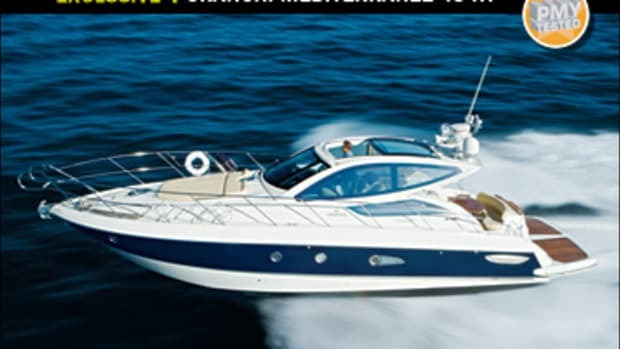 There&apos;s room for six on the settee and two more on the companion settee adjacent to the helm seat. Between the settees is a wet bar with barbecue and Vitrifrigo refrigerator/freezer, sweet standards that&apos;ll minimize trips below decks. A table at the C-shape settee is an ideal alfresco spot for lunch or dinner and easily converts into a sunpad for two by lowering the gas-assisted pedestal and adding some cushions. 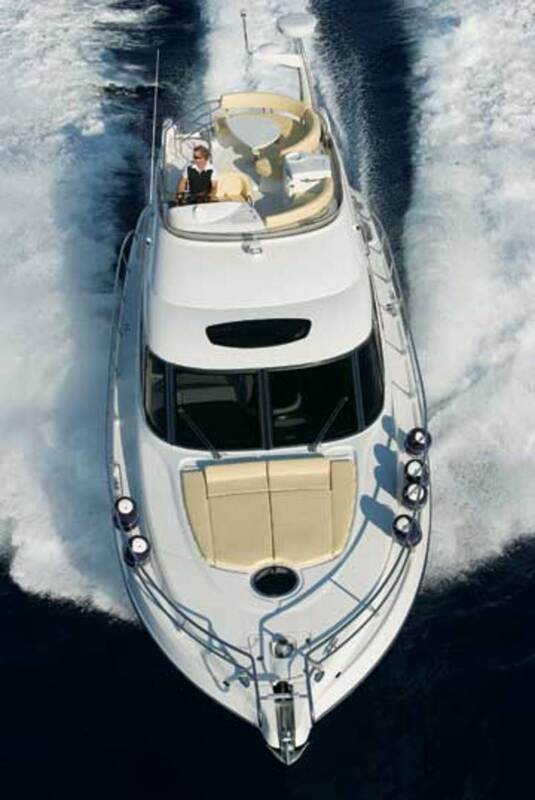 There&apos;s no hardtop, but shade seekers can duck under the standard bimini that can cover the forward half of or the entire flying bridge or retreat to the cockpit&apos;s L-shape settee, as the flying-bridge overhang shades its forward portion. If it gets too hot, her saloon will beckon. Cooled by a standard 48,000-Btu chilled-water air conditioning system, it&apos;s flooded with light from large forward-facing and side windows as well as from a skylight. The interior is thoroughly modern: The designers chose to showcase horizontal planes, as seen in the port-side credenza, adjacent teak dining table, galley countertop, and the contemporary-style L-shape settee to starboard. Dark wenge wood accents play beautifully off a light cherry interior and standard teak soles. Some traditionalists may find the space too modern, but most will appreciate the saloon&apos;s 6&apos;10” headroom and the light, airy feel. The same contrasting wood treatments are seen in her three staterooms, with modern touches echoed in the two heads by way of Frattini fixtures and basin-style glass sinks. 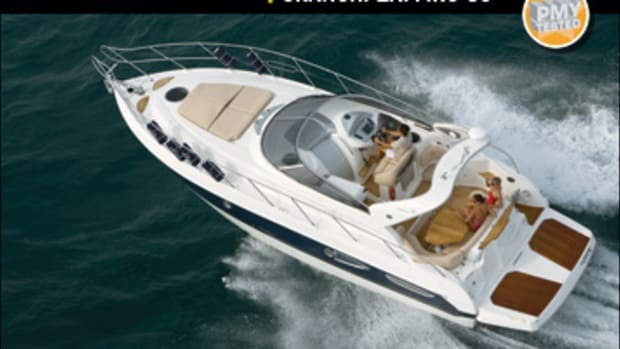 The saloon&apos;s design also does its best to give the lower helm station, opposite the galley, its own sense of space. 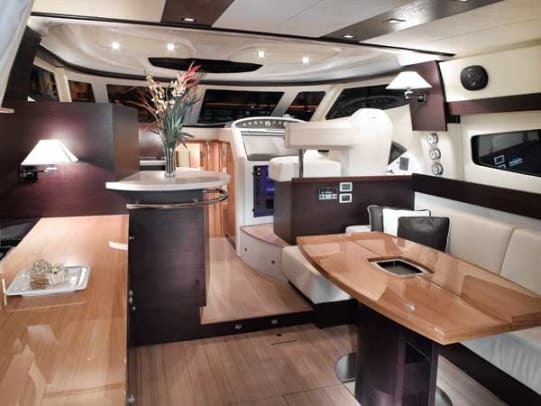 While I&apos;d rather see a dinette in place of the lower helm—this layout is not offered—the protection from the elements that it provides will be welcome. Overall, I found little on the Cranchi 50 to gripe about. I wasn&apos;t thrilled with the engine room&apos;s lack of headroom or with her restricted sightlines aft from the flying bridge, which is common in flying-bridge boats of this size. 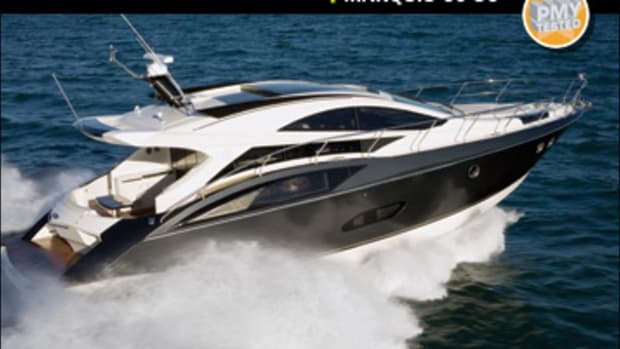 But I did admire her excellent close-quarters handling, respectable cruise and top-end speeds, and spacious flying bridge that promises a great time on the water. I&apos;d wager her three staterooms will be occupied every weekend this summer and that Office Ours&apos; engine and genset hours will reach triple digits by summer&apos;s end. Remember, it&apos;s all in the name of research. 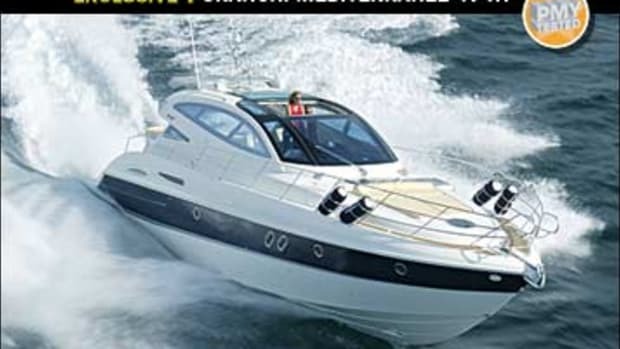 For more information on Cranchi Boats, including contact information, click here. 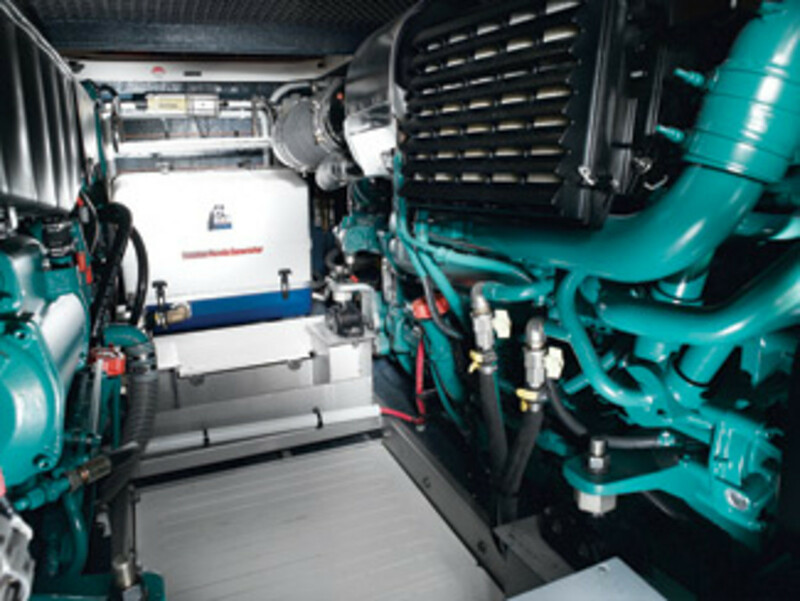 Two hatches on the 50 provide engine-room access: a cockpit day hatch and a removable (but heavy) floorboard in the saloon that provides better access to the standard 12-kW Fischer Panda genset. While headroom is only a shade more than four feet, I found all service points easy to reach, as the 1&apos;5"-wide walkway between the powerplants provided plenty of space for my 5&apos;11", 175-pound frame. The PMY crew should be as impressed with outboard access as well; there&apos;s more than two feet between each engine and the hull side.—J.M.